Apple TV 3, which can be the best media player for all Apple fans for enjoy movies at home. Cause it cannot support for all video formats, we here write this guide to teach you how to enjoy the MKV files on Apple TV 3. Easily convert MKV to MP4 for playback on Apple TV 3, do you have any good ideas? MKV, as we all know, as the typical container format, usually has the limitation with some media devices like iPad or some editing tools. You may meet something like this: "When I put mu MKV files into Apple TV 3, it pops up the errors like "support errors "there. 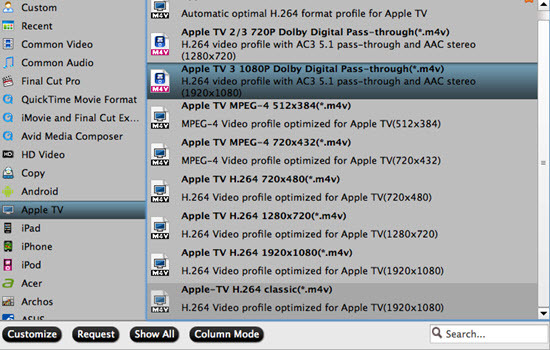 So we should find another way to enjoy our MKV files on Apple TV 3. The new Apple TV with 1080p HD gives you access to the best content - blockbuster movies, TV shows, sports, your music and photos, and more. If you are a movie fan you must have collected many movies in different format, such as MKV. But, Apple TV 3 doesn"t support MKV format, if you want to enjoy MKV format movies on Apple TV 3, you need to convert MKV movie to Apple TV 3, below is a guide for you to stream MKV to Apple TV 3 for playback. Converting tools we need: Pavtube Video Converter for Mac---A professional Apple TV converter for encoding and decoding all video formats. It can handle MKV files even you don't know which the codec in it and you don't have to figure it out,which totally save you from the format trouble thing. How to make MKV videos for Apple TV 3 for playing ? With the "Add files" on the main interface, we can easily load them in. You are recommended to choose "Apple TV">"Apple TV 3 1080p Dolby Digital Pass-through(*.m4v)". This format is perfect for playback on Apple TV. Such as resolution, bitrates, etc. you can choose AC3 5.1 audio for output, just click audio channels and choose 5.1 channels, the Apple TV 3 5.1 pass through can help you enjoy better sound. 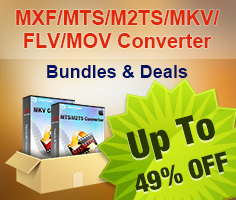 So if you need better enjoyment you are recommended to convert MKV movie files to ATV 3 with ac3 5.1 sound. Finally, click "Convert" button to start. You can convert MKV movies to ATV 3, besides you can encode 1080p MKV to 1080p M4V for ATV 3, etc. In this case, for nicely enjoying MKV movies on Apple TV 3 with the large screen enjoyment will not a dream anymore! With Pavtube MKV to Apple TV 3 converter, you can stream MKV to Apple TV 3 gen easily, so just follow the guide above and convert MKV movies to ATV 3 for watching as you want. How to Watch MKV and Flash Videos on Blackberry Z10? Can Galaxy S4 Play MKV, AVI, VOB, Tivo, MPG, FLV/F4V Videos?